Superheroes are what brought me into this game. I love the characters and being able to use them in a format like Dice Masters is just the best. There is just nothing better than building a Team of your favorite heroes/villains and putting them up against someone else’s group. Many of the abilities of the cards give you that feel that these dice are actually these characters moving about your playmat. Nobody has had more to do with building these characters than Stan Lee. This man created so many of the characters that we all love. Given his recent passing, and what he meant to the comic book world, we decided to build in tribute to Mr. Stan Lee. Only cards from the Marvel sets could be used for your Team build. In honour of Stan’s use of alliteration, we decided that the name of every two cards had to start with the same letter. You could not repeat the pair of letters more than once. This meant that you could only have 2 characters/actions that started with the letter “S”. Basic Action Cards were exempt from the above rule. While not required, you were encouraged to build your Team from this list of characters. 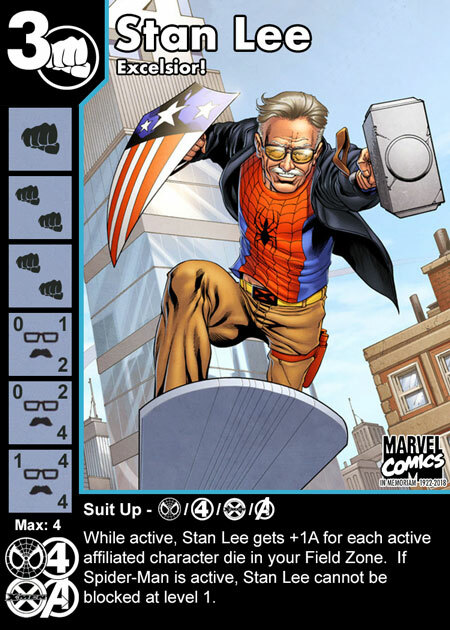 Also, while not required, I created a card in memory of Stan Lee. This was made available to everyone who wanted to include it. Given these parameters, I wanted to focus as much on using his creations as possible. I limited myself to his list of characters (not that the list was really all that limiting). I also wanted to focus on using Stan himself. He would be the core to the Team. The Team: Thank You Stan. So Stan was the main part of the Team. The other “S” was a no-brainer for me. It had to be Spider-man… but which one. I settled on Tangled Web as his ability helps boost the attack of other Spider-Friends. The Global also gave me the ability to make more Spiders when needed. This was going to be a combat based Team build, so the next add was another no brainer. Mary Jane was there to give either Spider-man or Stan Overcrush. Both would be good options. The Suit Up ability would also allow me to cycle Mary Jane when needed. My next addition to the Team was Black Widow. She is a cheap character with Deadly, and this would be a part of my control. As a second “B”, I added in Black Bolt. This was a back-up plan to help get the combat damage through. I struggled in this choice as I just used Madame Webb who has the same ability. I would only use this character sparingly. Back to the control portion of Widow. I needed a way to get characters to attack into her or block into her. Either would work. Enter Wasp. The force block Global would work perfectly here. Force anything and everything to block Widow and out they go. Since I had a spare “W” slot now, I went with Wong. I chose the Sidekick buffing version as it would play into the combat-centric nature of the Team. I still needed something to pair with Mary Jane for the last “M” slot. Madame Masque was my first thought (Global protection), but she would affect me as well. I didn’t anticipate “When Fielded” abilities would be a big deal tongiht, so Masque was out. I settled on Mimic for the last spot. I chose the SR version as my flex character. I figured he could become whatever PITA character my opponent brought that I had trouble dealing with. Investigation was my first BAC as I needed some way to get more dice and I have not used the Duck in a long time. Focus Power was my final add as it was a way to get both Spider-man and Stan Lee down to level 1, where they would be most effective. Human Torch was here to burn me when characters were fielded and Hulk (from Thor) was there to burn me down when I blocked. I got an early 12 in with a Spider-man, Stan Lee, and Spiderfied Sidekick. However, that was as close as I could get. I struggled getting characters back out and Widow never hit the Field. He took out Stan in the final turn to outnumber me. Human Torch… again. I think I missed the memo on bringing him tonight. This was an interesting build from Gord. He’ll be writing this one up. It was basically bad decisions for me all around. I did have the satisfaction of copying his Torch with Mimic, but it was too little, too late. The Widow control worked well at taking out his Human Torch, but he rerolled every… single… time. Human Torch again????? Wait… This was not the burning one. This was the one that got buffed when characters were Fielded. He actually bought a Professor X in the early game and got him out on level 3. This proved really annoying for my Overcrush and combat tricks. It is not easy to KO a 9D character. I loaded up my Field with characters and then instead of spending all of my masks on PXG, I spent them on Wasp’s Global. I forced his entire Field to block Widow to clear them out. His next turn, he only rerolled one character back. I had more than enough damage coming through with everything for lethal. Tangled Web is one of my favourite versions of Spider-man. The synergy with other Spider-Friends just cannot be beat. Pairing him with MJ is like peanut butter and jam. Using Deadly and the force block Global is something I have used before and I forgot how effective it can be. I purposely never went to Black Bolt tonight as it was too similar to the last Team I used. I probably should have looked at another “B” character, but it jumped out at me during the building process. With Mimic, I didn’t go to him soon enough in some games. He could have been more helpful than he was. I think this was more user error than anything else. The rest of the build was as you would expect. They all served their purpose well. This was not a competitive Team at all. This was a tribute to Stan Lee. The most fun part of this build was going through the list of characters that he had a hand in creating. There were many that I was not aware were part of his legacy. I really like the challenge with so many self imposed restrictions on this build. It was fun. Did your scene pay tribute to Stan Lee this week? What did you do? We’d love to hear what the Dice Masters Community at large did for this Pop Culture Icon. Let us know in the comments below. Posted in Constructed, Dice Masters, Team BuildingTagged Black Bolt, Black Widow, Focus Power, Investigation, Mary Jane, Mimic, Spider-man, Stan Lee, Wasp, WongcommentLeave a Comment on Thank You Stan!